If you can Imagine I use A LOT of epoxy so I’ve heard everything from some of the most uniformed epoxy sales people around looking to land a high-volume client. The statements above are so general and so misleading it’s time to have a ‘Come to Jesus meeting” on this topic. How do you make any sense of these statements especially if you are in the business of installing epoxy flooring and have the task of insuring the epoxy you install over time will be the best overall product for the long term of your customers’ floor? Working with substandard materials can quickly end your epoxy installing aspirations. Compared to what? Exactly. How do we compare epoxies or benchmark them to others? If you were look at comparing stocks, because your stock-broker told you “This is the best choice” what would you do? You would grab a prospectus on the company and benchmark it against other stocks in the same industry. It you were buying a car you would analyze the specs on the cars, comparing it to other cars in its class to make sure you bought the best value with the best specs for the type of car you want. Why don’t we do this with epoxy coatings? Well, I have to, because when you spend millions on epoxy, you tend to learn a bit about epoxy quality, desirable and undesirable characteristics to find the best epoxy and value. While some characteristics of epoxies are only learned from using the products you can learn a lot one important way. This is by looking at the product data sheets for the epoxy coatings you are comparing. They are the spec sheets or the prospectus of the epoxy product. You can learn a lot about a product by reading this document. On the product data sheet, you should find standardized laboratory coating testing hopefully done by a 3rd party laboratory. If the manufacture doesn’t disclose these standardized test results by a third party then you can safely disqualify this epoxy coating as a candidate for your flooring. First off you will need to look at what the product is recommended for. If you are using this epoxy for something it wasn’t designed for then you need to know. It may say 100% solids resin, it could say 95% or 65%. What does this mean. In short, in the coatings world it means how much of this product will be present when the epoxy flooring cures or “dries.” Does this mean that 100% is better than 95%? Not necessarily. It just means the product doesn’t evaporate and lose build. When looking for a primer, you might want a product that is 95% solids and 5% solvent. Solvents are carriers that carry products. The solvent may carry the epoxy into the concrete substrate much more effectively then a 100% product. And on a 2nd coat do you think something with solvent will better re-emulsify the base to create chemical adhesion. Maybe. The point is epoxies are formulated for different purposes and drawing a quick conclusion based on a products’ solids content is elementary. If you are in the coatings world I don’t have to tell you that in the US the EPA in recent years been increasingly focused on lowering the Volatile Organic Compounds. I can’t say that low VOC’s have anything to do with quality as many 100% solids epoxies have zero. You also couldn’t say that a product with low VOC’s is safe as there are many toxic obscure solvents not regulated by the EPA or affected by VOC laws. So low VOC’ does not necessarily mean a product is safer or “earth friendly” or less toxic as I can think of a number of resins that would put you on your knees, fumes that debilitate you, because your respirator is useless as the fumes absorb into your skin and eyes. These are ‘low VOC’ products so don’t confuse it with not being toxic or earth friendly. It did take some time for manufacturers to reformulate their products after the stricter laws passed. Obviously applying an epoxy floor coating thicker then recommended would not be advisable. But when comparing apples to apples you may find that the coverage is lower or higher than the other. Higher coverage is influenced by product viscosity and sometimes solids content. You could see how coverage and MIL thickness would have an inverse relationship. The thinner you spread it the epoxy the further the coverage. Is thicker always better? It depends on the coating and what it’s designed for. Some polyureas or polyspartics you wouldn’t want to thick because they would be too rubbery. Some primers go down thinner and some moisture barrier primers have to be a certain thickness or MILS to work properly so just follow the recommendations and realize this is one of many factors of your comparison. How do we compare epoxies’ abrasive resistance among each other? A Taber adrasor CS-17 calibrase wheel with 1000 gram total load and 500 cycles. 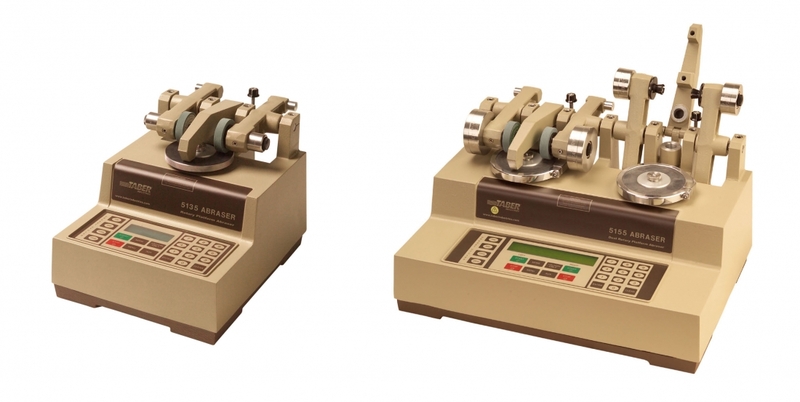 The Taber resistance test is essentially a piece of testing equipment that is basically two sanding wheels that are applied to a coating product at 500 cycles to determine product loss. 1000mg of the coating is placed below the sanding wheels and sanded 500 rotations. The sample is removed, cleaned, then weighed. The results are recorded in mg loss. A product with 16mg loss would be called more abrasive resistant then one with a 44 mg loss. But one thing to keep in mind polyspartic coatings may react much differently than a “normal” epoxy. Do you need high abrasion resistance in a body coat or primer? Abrasion resistance is most important for Topcoats, and I don’t many people using normally epoxies as topcoats as these days there are many better options. Looking at this data and knowing how not to interpret it is just as important as knowing how. In general, the test is bending the product at three points to determine at which PSI it fails. The higher the number the better the flexural strength. But humor me for a minute. Do you think if a 4000 PSI slab with 400 PSI flexural strength cracks that a 9700PSI flexural strength coating is going to hold the substrate together with vertical separation? I’m not an engineer, but have probably seen more of this first hand. Compressive strength is measured by crushing the epoxy in a press and measuring at what PSI the product fails. What if your 6 in slab is 2000 PSI. Is a 12 Mil epoxy coating with 10,000 PSI going to strengthen the concrete floor. Probably doesn’t hurt, but you see what I am saying. There are certain coatings or resins that are strong but perform much differently to compression so assuming that high PSI failure is best for every situation would be a generalization. Tensile strength in epoxy flooring is the resistance of a material to breaking under tension. This is also communicated in terms of failure at a given pounds per square inch(PSI). Chemical resistant charts are also featured on most product data sheets. Some epoxies have higher chemical resistance or different thresholds to different chemicals. The key is finding a coating that works best for the facilities’ needs. the best epoxy, most durable epoxy, or most adhesive epoxy are just statements. These statements can be verified by interpreting testing results. In my opinion epoxy flooring material should be chose with floor use in mind. Traffic type whether foot,vehicular, or airplane should be considered. You don’t want to over engineer an Epoxy Flooring system as you wouldn’t want to under engineer one either. Finding the best quality and value for your specific epoxy flooring needs should be determined by someone that has experience and understanding for interpreting these standard epoxy test results.